For the boxing purists this promises to be the biggest fight of 2017. 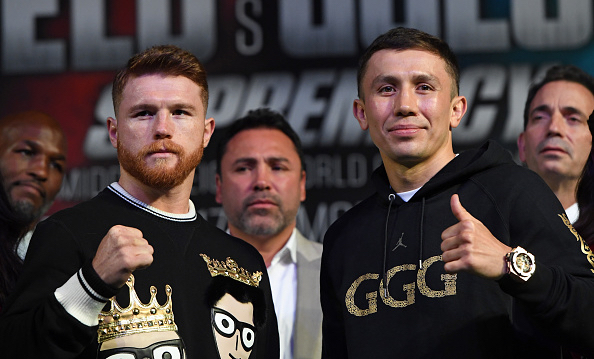 And don’t rule them out doing it again in 2018, such is the expectation of a classic when Gennady Golovkin and Canelo Alvarez square off in Las Vegas on Sunday morning (SA time), writes GARY LEMKE. The two warriors have shown nothing but respect for each other in the build-up to the fight for Golovkin’s middleweight titles, which is in stark contrast to the trash-talking generated by both the Floyd Mayweather and Conor McGregor camps ahead of their ‘cross-code’ event, which saw Mayweather win by 10th-round stoppage after a less than memorable encounter. If ‘GGG’, or ‘Triple G’ as he is also known, and Alvarez are still standing by round 10, then fans will have witnessed the world’s two finest middleweights wage war. There are no ifs or buts. Both are competent boxers, but it’s their fighters’ hearts and devastating punching power that they bring to the table. Among boxing fans, this showdown between the unbeaten (in 37 fights) Kazakhstan champion and the (once-beaten in 51 contests) Mexican, is a throwback to the days when we saw Marvin Hagler, Thomas Hearns, Sugar Ray Leonard and Roberto Duran belt one another black and blue. These are two thunderous punchers who prefer to let their fists do the talking. Although Golovkin, who missed the birth of his second daughter in order to complete his training camp this week, has been the more vocal of the two. ‘One punch from either of us could change the life of the other forever,’ said the holder of most of the world middleweight titles as he and his challenger made their grand arrivals on the Las Vegas Strip to the roar of hundreds of fans. It’s not just that both carry concussive power in their firsts. They are not ‘throw and hope for the best’ bombers. Both have serious boxing skills, able to fight behind the left jab and look for openings to both the head and body. It might be that Golovkin is the easier man to hit, for Alvarez is deceptively quick to get out of the way from a power shot, but he’s a walk-forward fighter, who doesn’t know the meaning of defeat. He also hasn’t been knocked off his feet, either as an amateur or a professional, and despite being 35 years old, he remains relatively fresh-faced and injury-free. Only four opponents have heard the final bell against Golovkin, and one of them was American Daniel Jacobs earlier this year. The fact that Golovkin went the full 12 rounds has fuelled speculation – or hope? – that his best days are behind him, although that’s a risky assumption, given that the previous time he’s been taken the distance was by Algeria’s Amar Amari back in 2008. By contrast, the 27-year-old Mexican has stopped ‘only’ 34 of 49 opponents, which confirms the view that Golovkin is the harder puncher, unbeaten, the champion, taller and heavier and therefore the favourite to win the war. That’s the way the bookmakers are calling the fight. He’s 6-10 to win (Alvarez is 13-10) and the shortest price for manner of victory is Golovkin by KO, TKO or disqualification, at 14-10. The odds suggest that should the fight go the full 12 rounds, Alvarez will win (2-1, with Golovkin as wide as 7-2 on points), while Alvarez is only 8-1 to stop Golovkin. It has all the makings of a fascinating, but explosive, fight.